Every Monday, I'm featuring a post called called "Grace for Dinner." Each of these posts will include a recipe for a simple, delicious dinner food and a prayer of blessing for you. My hope is to impart grace to you body and soul with these posts. Today I'm so happy to be featuring Melissa from 320 Sycamore. 320 Sycamore is chock-full of helpful posts--from small projects to whole-house renovations, from great deals to words of encouragement. Melissa is one of the bloggers I admire most, and I'm proud to be able to call her a blogging friend and a real-life friend. I am honored to be over at Imparting Grace today~Richella makes everyone feel at home here! 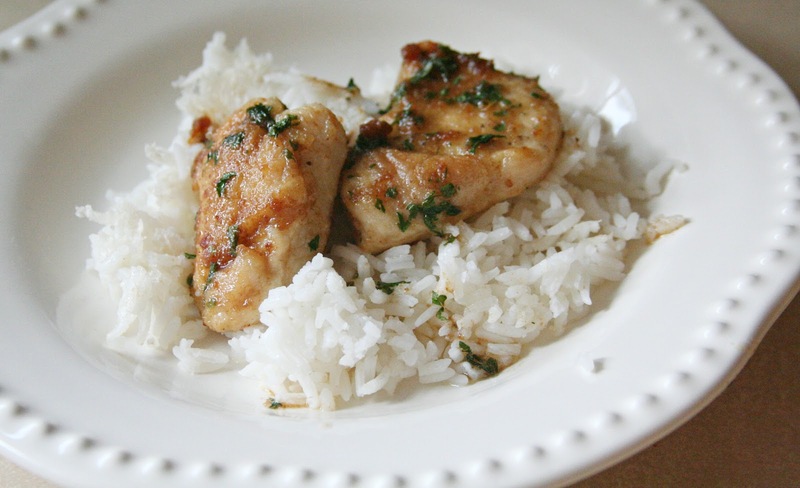 This is one of my family’s favorite, do-able recipes~if I ask what they want for dinner, most of the time they yell, “lemon chicken!” We have made it for birthdays, company, Sunday dinners, missionaries, and grandparents. It’s a winner in our book! Put flour in a plastic bag, add chicken breasts, and shake to coat. Melt butter and oil in a large skillet. Cook chicken breasts on moderately high heat, approximately 4 minutes on each side or until cooked through. Sprinkle with salt and pepper. Place chicken in an ovenproof dish; keep warm in oven set at 250 degrees. Prepare lemon sauce. Add butter to skillet and melt, scraping up brown bits in pan. Remove from heat; add parsley and lemon juice. Pour hot sauce over chicken. Serve with rice. Melissa, this looks absolutely delicious! Thank you so much for sharing the recipe with us. Dear Lord, we are so grateful to gather at the table. We are grateful to be fed by You--our bodies with physical food, our souls with spiritual food. Sometimes we feel anxious by all that's going on our world, but we know that You are good. Help us always to trust You to provide just what we need. Amen. That looks delicious!! And easy too. :) T loves lemon chicken! When I was a kid my mom made lemon chicken once. It was so horrible that my dad and siblings all pushed away from the table and balked at the idea of eating more than a bite. My mom was so hurt that my dad made us all eat every bite. Then, as you might have guessed, we all got deathly ill that night. There had been something wrong with the chicken! Only my mom didn't get sick because she was so upset during the meal that she couldn't eat. It's a funny family story now. Looks delish and so easy. I'm always looking for new ways to cook chicken. :o) Thanks!